This training mobile application is part of a larger training system, designed to provide training to groups of people in a 3D immersive environment. The application enables testing of trainees, and is eventually responsible for generating completion certificates for individuals who have completed a training module. 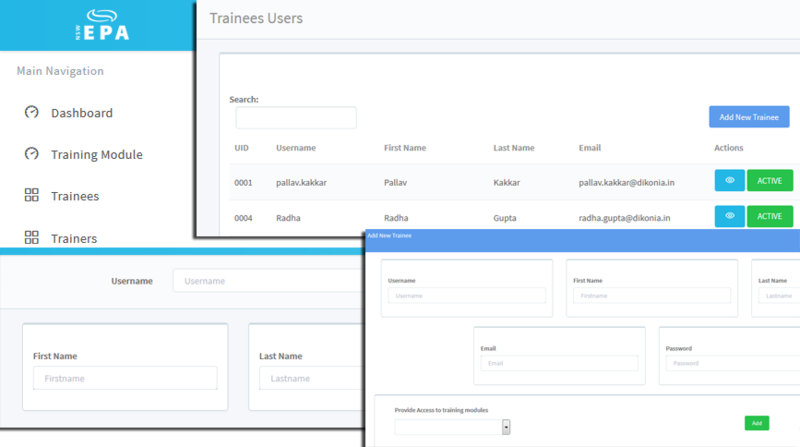 Built on the technologies of Laravel and Angular JS, the backend of the application is used for content management, user management and keeping records of progress of trainees. The front end mobile application is designed to a simplistic interface, using which trainees participate in quizzes for every module. Integration of QR codes, and live updates, ensures that trainers and the admin can keep a check on possible cheating, making this system very secure. IOS app, Web admin, QR Code Integration and Web Services to connect admin and app. QR Code Integration - Each question added to the system was assigned a unique code. This code could be used to generate a unique QR code, which when scanned would display the designated question on the mobile app. The question also displays associated multiple choices, that are also added via the backend system. The system is also able to record answers by trainees, and let them know whether or not they had answered all questions in a training module correctly. User Management - The admin has the ability to add both trainees and trainers to the system. Every trainer added to the system as access to all information regarding all the trainees, and all the training modules built on the system. Trainers are also able to add trainees to the system, and then assign them specific training modules. The system as been built to ensure that a trainee can access any training module that he/she has not been provided access to. The trainers however, are unable to modify or create training modules, as this functionality remains with the admin. Report Generation - The whole system consists of many statistics that help both trainers and the admin to quantify progress of individual trainees. Starting with the number of questions a trainee has attempted, and how many of them he has gotten right, to how many trainees have attempted a module, and how many of them completed a module successfully, there are many insightful statistics that have been built into the system. Further, when a trainee has successfully completed a training module, the trainer and admin user can generate training module certificates, and module-wise reports of how a trainee fared. These reports are made available to the trainee automatically by the system, when the trainee qualifies. Laravel & AngularJS Integration - Based on the solution designed, Laravel & AngularJS were used to code the backend. We chose to use these technologies to be able to take advantage of the server side abilities of Laravel, and a much faster and slick AngularJS front end. This also enabled us to use the secure database connectivity of Laravel, which also simplified database management. Together with Laravel and Angular JS, the code developed for the application was minimalistic, simple and quick at providing responses, which was critical for the high speed nature of the application.